Wheaten Terrier? Keridown are Evelyn and Robert Ross and back in 1977 we wanted to buy our first dog…….but what breed?…….with so many to choose from. We knew what we didn’t want – a dog who shed his coat like ‘Lucky’ Evelyn’s parents Shetland Sheepdog who although lovely resulted in hairy clothes every visit…..but how do you choose? 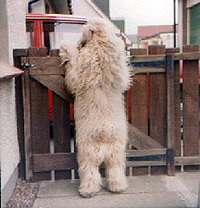 Our answer…….we bought a book on dog breeds, read about the wheaten terrier, saw the photos and we were sold. Back in 1977 the most wheaten terrier puppies ever born in any one year in the UK was 50 and there was a 2 year waiting list for a puppy, so our chances were slim to nonexistent. We were desperate to own a dog and would not have waited ……but down to luck or fate and a few phone calls later as they say we were told of a breeder who had one male puppy not spoken for and to cut a long story short we got him home in a fortnight. The purchase of a girl soon followed and in 1979 we had bred our first litter – our life had changed forever. Since our early days in the breed we have been at the forefront of innovation in Soft Coated Wheaten Terrier breeding and presentation in the UK often leading the way for others to follow. By rhyme or reason we achieved success early with our first boy gaining his Champion title at Crufts in 1980. He had sired our first litter the year before from which we kept a male who became our first homebred champion and his mum our first girl also became a Champion. Another male from this first litter who we had not kept should also have gained his title winning 2 CC’s and a reserve without gaining the elusive third. Everything in the garden was rosy ….. we could have repeated this mating a few more times and quite possibly in the process made up a few more champions but we followed a different course. We had learned to separate emotion and reality, our dogs were part of the family, lived in the house, we loved them but we could see their faults in relation to the breed standard. We believed that the breed had to move forward as it had done in various other countries much against the general concensus of opinion in the uk.